Everyone needs a January Quilt. Or a February quilt, since there’s only 11 days left of January. It also helps when there is a very bright Heather Bailey Pop Garden print on the back, and if the weather is sunny and warm enough to be outside without a coat. I LOVE this quilt. It has to be one of my favorites by far. First time visiting you blog…and WOW….i was curious at first what line of fabric you used, but then i read "a little of everything", which is awesome. Absolutely gorgeous! I love all those colours together – and that backing print is amazing!! It's beautiful and cheery and very inspiring! I love it! Great job! wow! I love it! I think quilts with a ton of different fabrics are just fabulous! Oh my gosh! Love those colors! Love this quilt, and love your whole aesthetic. Very inspiring! Absolutely love this quilt and want it for myself! Such gorgeous colours. So good for the eyes first thing in the morning. Makes me want to make one NOW. Thanks for sharing. Okay.. I love all of your stuff! This quilt is awesome! It's so fun and cheery! I'm looking at your tutorial list and want to make everything! I might try this design or the hourglass design as a scrap quilt. Lovely! I am working on one now that is similar with "windmills" similar to V and Co's. How did you quilt it? Stippling? I can't see it closely enough! Did you have any trouble where your points come together? What a great quilt to finish in the winter. The colors are so fresh and vibrant, it gives us all hope that Spring is around the corner! Lovely! Did you have any particular method to your madness when pairing the blocks to make the HSTs, or is it all random? Lovely bright colors. The perfect winter quilt! Absolutely gorgeous. One of the nicest quilts I have seen. Lovelylovelylovely. Oh how beautiful! It reminds me of warmth and summertime! So nice! Just lovely! 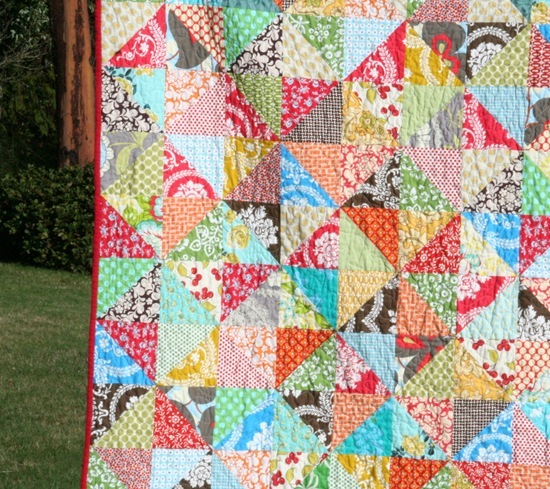 Do you choose colors for a quilt like this or just start grabbing fabric randomly? It all works so well together. It looks like a real stash buster! Thanks for posting a picture for us that need inspiration. How beautiful, even though it's hot over here in Oz I can still appreciate the warmth. And I'm glad i'm not the only one, I never have time to reply to comments, saving that for emails, thanks for reassuring me! Thanks for being a bright spot on the web – you're an inspiration! Hey, your amazing! Just wanted to let you know that your last "Timing" quilt totally inspired me, so I stayed up late and whipped one up! Check it out…www.ourtaylorlife.blogspot.com, thanks for great inspiration. I might have to make one like this now! It's beautiful! Way to make January more beautiful. pretty and bright for a dull sun-less month. This is still my favorite right now and I think everyone needs one like it, no matter the month!!! such a happy bright quilt! Perfect for the middle of January. Beautiful! It looks so cheerful! This quilt is stunning. Fantastic….I love it and it's now on my 'in my head wish list'. Making or even seeing a quilt like this in winter really gives a summer feeling…ahhh this is sooo good, just looking at the colors! Perfect, Wonderful, Bright, Cheery!! Good work!! Brightens up the dreary days of winter. Thank you for sharing. Holy cow! You do such a great job of combining fabrics. Beautiful!!! The red binding was a brilliant choice. To my eye, the chocolate browns really pop and make the other colors appear even more rich and vibrant. This is a happy quilt. We need a little happy in January after the "let down" of the holidays. Love it!! Looks like you're ready to picnic. Oh, wow! Absolutely gorgeous. I need a little eye joy — The January gloom is getting to me! Awesome, love it, thank you for sharing. I have blogged about you and the great Sewing,Crafty,Bloggy Links button. Thank you for sharing. This a beautiful quilt. Great job! I have NO business starting a new quilt but I really want to duplicate this. I just read the directions on the tan/red one and must try it. 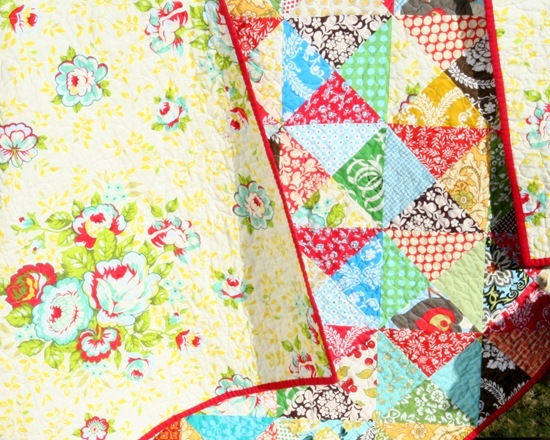 Your scrappy January Quilt is gorgeous.Love it I don't know what it is but the more fabrics the beter I like it. For some reason scrap quilts pull me in right away because they are more interested to me. 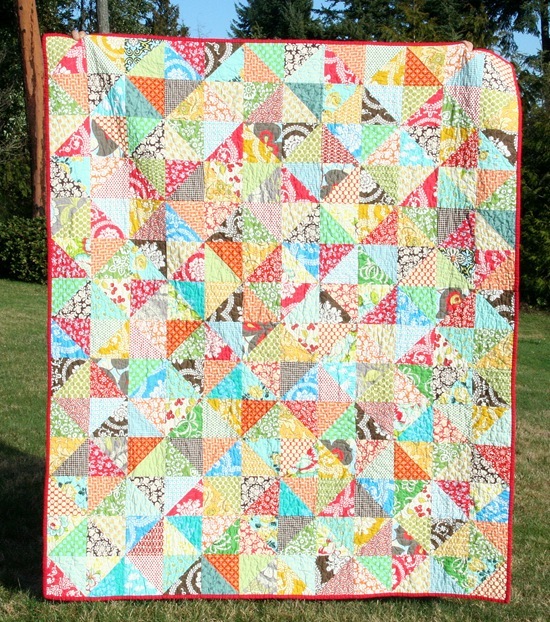 I am head-over-heels in love with that quilt! Nice and intricate with smaller squares…how long did you take to make this one? I LOVE it. Anything with a ton of prints used well is lovely in my book. So beautiful, the fabrics, the colors, and the pattern is simple and lovely! I just found your blog through Camille's. This quilt is absolutely stunning! Wow! I'm looking forward to following your blog.